Whether your door is a chain drive, belt drive, screw drive, direct drive, or jackshaft, you need all of the parts to work together to open and close your hefty garage door at the push of a button. In most cases, your opener is a motor that connects to a trolley and pushes and pulls that trolley along its tracks to move the door. Jackshaft openers have a motor on the torsion rods instead and exert pressure on those to provide the necessary force. Jackshafts have more complicated repair issues and need to be handled by a trained technician to avoid injury. Our expert technicians are well versed in all types of openers and can get you repaired quickly. A door that won't respond has one or more parts that aren’t doing their job. A tired motor may be moving your door too slowly, or in spurts. Moving pieces do eventually accrue a lot of wear, and your chain, belt, or screw may need to be replaced. Sometimes, a trolley gets knocked off its track, or wasn't aligned properly in the first place, and that usually means that your door either moves in a jerky fashion or can't move at all. 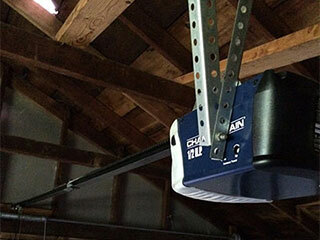 You need professional help to repair or replace the pieces in your garage door opener, and we're happy to be of service. Garage Door Repair North Saint Paul has made a name for ourselves in the industry by being the best and the fastest service with the most affordable prices you can find for the quality we offer. We pride ourselves on satisfied customers who stay loyal year after year because of our exceptional service. If you need a repair, call us today to schedule a professional visit and see for yourself why we're your best choice for garage door repairs.